Deep burgundy hue and rich aromas of dark cherry, blackcurrant, vanilla and baking spice. Concentrated flavors including wild berries, plum, licorice and mocha. 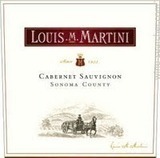 The Louis M. Martini Sonoma County Cabernet Sauvignon wine reflects the best of the warm, narrow Dry Creek Valley and the hot yet wind-cooled Alexander Valley. Together, these unique features create a rich, superbly balanced Cabernet Sauvignon with copious yet supple tannins. Those tannins make the young wine approachable but will still give it enough texture to age gracefully. This wine features concentrated flavors including wild berries, plum, licorice and mocha. The full-bodied and mouth-coating texture on the palate leads to a long and graceful finish. Cabernet Sauvignon, Merlot , Petite Sirah,Cabernet Franc.